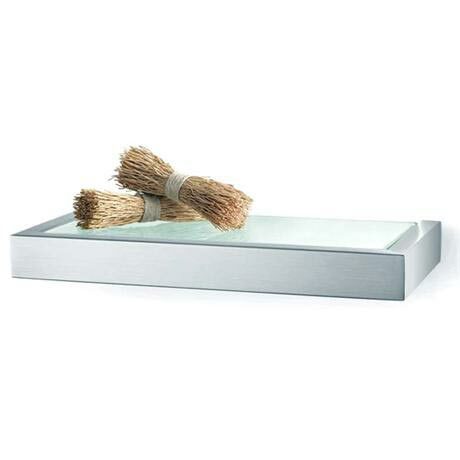 The Linea 26.5cm Stainless Steel and Glass Bathroom Shelf from Zack. Bring a clean contemporary look to your bathroom via this sleek range of wall mounted brushed steel accessories. Designed by and made exclusively for Zack of Germany each solidly engineered bathroom shelf is built to last and features chic, fuss-free styling that will complement any modern scenario. The combination of steel and glass creates a sense of contemporary simplicity - something that the Linea range is known for. As with all Zack products, the build quality of this bathroom shelf is of the highest order, providing a lifetime of use. Stainless Steel and Glass Bathroom Shelf from the linea range. Made of high-quality, brushed stainless steel. Designed by and made exclusively for Zack of Germany. German made therefore build quality excellent. Came well packaged and instructions were clear and concise. What more can I say.